On Sunday, I watched the match between Wa All Stars FC and Hearts of Oak SC. The away side won the match after a first half goal by Mahatma Osumanu Otoo. At times, I was really impressed by the home side and their smart, cultured style of play. The midfielders of Wa All Stars FC all proved to be great players and they deserved at least a point from this match. Hearts of Oak SC was reduced to ten men in the first half when Philip Boampong was sent off after two yellow cards. This changed the game and Hearts played a defensive game and took few chances. Goalkeeper Robert Dabuo (born 10.11.1990) is the captain of Wa All Stars FC. Dabuo, who has represented Ghana at U-17, U-20 and B-level, is widely regarded as one of the best goalkeepers in Ghana and he is knocking on the door of the Black Stars, the Ghana national football team. This afternoon, Dabuo seemed confident but his judgment can be questioned when Mahatma Osumanu Otoo scored the only goal of the match. Dabuo should have stayed on the line. I was a bit surprised to see the defensive line-up of Wa All Stars FC. Richard Akrofi, who I believed was a midfielder, did in fact prove to be a lanky central defender. Akrofi did well and formed a strong partnership with Joshua Tijani, the former King Faisal Babes player. The attackers of Hearts of Oak SC unleashed remarkably few shots at goal and Akrofi / Tijani deserves credit. The full-backs of Wa All Stars FC are both key players. Right-back Livingstone Logoh (born 08.08.1987) and left-back Joshua Otoo are both products of the Red Bull Academy and are disciplined, modern full-backs with attacking qualities. Otoo impressed me the most, his crosses was often clinical. The petit, hard-working Ebenezer Adjei (born 04.08.1988) was solid as the most defensive of the central midfielders. Adjei was replaced with striker Samuel Boateng who it was difficult to get an impression of. Francis Mantey (born 15.11.1987), also a petit central midfielder, seemed to cover every inch of grass on the field. His passes always had a purpose. However, from my point of view, Seidu Salifu (born 02.08.1990) was the big star of the match. The central midfielder / playmaker controlled the flow of Wa All Stars FC offensive play and were involved in several passing moves that looked promising. The creative Salifu is a former player of Real Tamale United FC and he has earned rave reviews this season. Wa All Stars FC played with three attackers. Samuel Azumah (born 13.09.1990) seemed to play as left-winger, Godfred Kwame Gyasi seemed to play as a centre-forward and Alex Tawiah seemed to play as a right-winger. However, all three attackers wandered a lot, trying to confuse the defenders of Hearts of Oak SC. Azumah, who had scored goals in the two last matches of the team, proved to be a powerful player but he struggled to get into the match. Azumah is a former reserve team player at Berekum Chelsea FC. Azumah was replaced with Frank Nortey Sowah (born 06.05.1991). Sowah starred from the right-wing and was able to bring life into the game. Sowah was one of the key players for Wa All Stars FC last season and I am surprised to see him at the bench. Alex Tawiah is a completely unknown player to me. He worked hard and was the only of the three attackers who played the whole match. Gyasi is a strong centre-forward who causes problems with his enthusiasm and power but he seems a bit ineffective. Gyasi was replaced with central midfielder Samuel Norgbey who managed to impress me during the few minutes he player. Norgbey was lively and brought the ball forward effectively with his strong running. Goalkeeper Sammy Adjei (born 01.09.1980) was rock-solid in goal for Hearts of Oak SC. The experienced number one, that seems to struggle to get back into the Black Stars, the Ghana national football team, is arguably the best goalkeeper in the league but he sometimes seems a bit arrogant. Perhaps he feels that he is too good for the local Ghanaian league. As always, right-back Akwasi Bobie Ansah (born 14.12.1986) played a good match. It is difficult to name a more consistent player that Ansah. Powerful, disciplined and dangerous every time he runs down the flank. The picture is of Ansah and is taken from accraheartsofoak.com. Left-back Samuel Enzemoba (born 11.11.1987) was the captain of Hearts of Oak SC and the versatile and experienced defender was effective, but not spectacular. Hearts of Oak SC played with three central defenders. The steel-man Philip Boampong (born 01.01.1990) was shielding the central defensive pair of the towering Kofi Agyare (born 19.02.1982) and the powerful Godwin Osei Bonsu (born 03.03.1989). I’ve seen Boampong several times and he is such a great player to have on your side but he plays way too tough and at times he is simply dangerous. Boampong was red-carded in the first half. Agyare is one of these rugged central defenders that there are so many of in the GLO Premier League. He uses his size and muscles with great effect. Bonsu is the most interesting of the three from my point of view. Bonsu is more cultured and despite being tough and strong, he is also able to do something constructive with the ball. Left-sided midfielder Thomas Arnold Abbey, apparently 18 years old, is a hyped player these days and it was interesting to see him in action for the first time. Abbey impressed me with his hard-work and he also showed glimpses of creativity. It was Abbey’s wonderful cross that lead to the goal of Otoo. I am sure that Abbey’s qualities are better suited to games where Hearts of Oak SC are dictating the play. Central midfielder Abubakar Moro (born 07.08.1991) has become a key player for Hearts of Oak SC. Moro was the engine of the team, spreading passes to the more creative players. Moro always works hard but he is not a very entertaining player. If he manages to improve his creativity, Moro will become a quality player. Right-sided midfielder Isaac Ofori played against his former team and was largely disappointing. He seemed to lack confidence and the only time he managed to outsmart the Wa All Stars FC defenders, he chose to pass when he had a clear shot at goal. Support striker Raymond Darkeh (born 04.12.1984) was a surprise starter beside striker Mahatma Osumanu Otoo (born 06.02.1992). The hard-working, burly Darkeh was actually quite positive and he had the assist to the goal of Otoo. 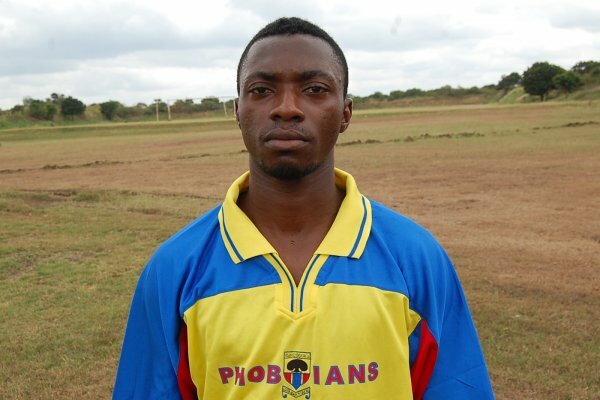 Darkeh was sacrificed when Hearts of Oak SC became 10 men and was replaced with the petit midfielder Joseph Tagoe. Tagoe, also known as Bobby Short, is a very interesting player who impressed at trials at Norwegian top club Rosenborg BK earlier this year. Tagoe was described as one of the most skillful players ever seen on a Norwegian training ground but he was not able to use his technique effectively. Tagoe was playing for Sharks FC in the Nigeria Premier League in 2008-2009 but he has not played an official match for more than two years due to contractual problems. When Tagoe entered the match, he took over the right side of the midfield and Ofori went up front as the support striker. Otoo, the star striker of Hearts of Oak SC, scored the only goal of the match. Abbey crossed from the left, Darkeh won the header and Otoo was faster than rushing goalkeeper Dabuo and smashed the ball in the net. Otoo had a very difficult game and did not get much support. Nevertheless, by scoring the only goal of the match, he will most likely be satisfied. Otoo was replaced with Ernest Ackon in the last minute of the match. Ackon, signed from Metro Stars FC before the season, played about ten seconds of the game. I was investigeting young player in Ghana on some web pages and trough some contacts in ghana,but with no help regarding names of some clubs and academys.